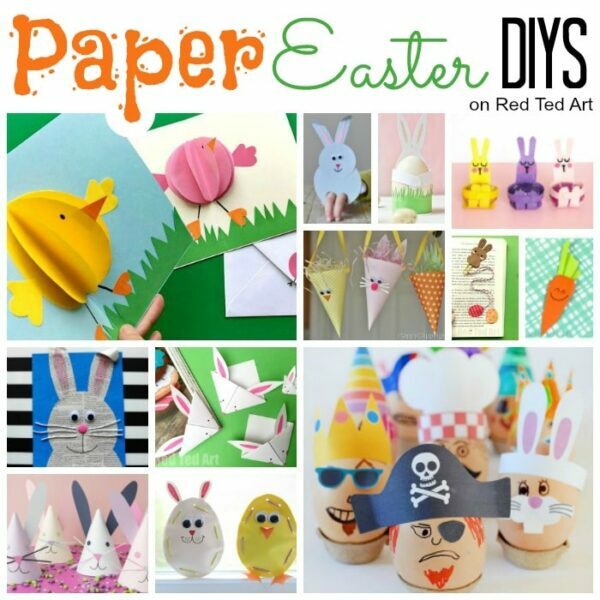 We almost have all our Spring and Easter Paper Weaving Projects ready for you to enjoy! 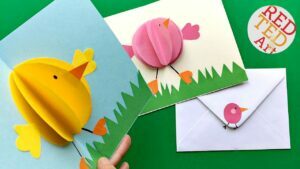 You will hopefully have seen our super cute and easy Woven Chick & Egg Cards as well as the stunning Spring Flower Basket Weaving Cards for Mother’s Day. Just gorgeous. 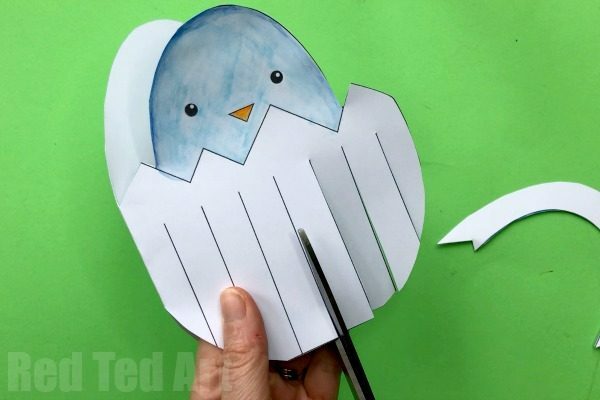 Great Free Printables for you to enjoy at home and in the classroom. 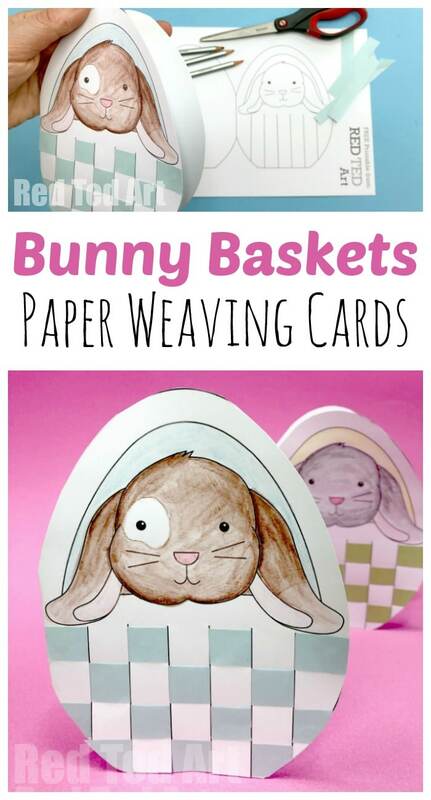 Today our mini Paper Weaving series continues with these super duper cute Woven Bunny Basket Cards. 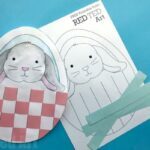 Yes more great paper weaving printables – this time Bunny themed. 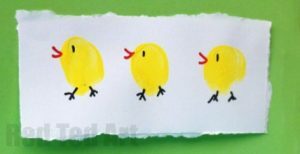 Don’t you love how that little bunny basked is Egg Shaped? Just too cute! 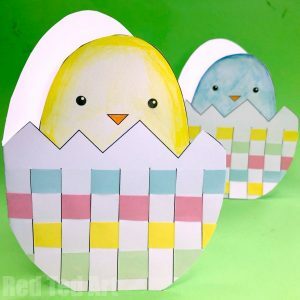 This make a wonderful addition to our Paper Easter Craft Collection, as well as set of Preschool Easter Crafts! Enjoy. 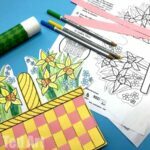 As with our other Paper Weaving Projects, we have a larger version of this printable too, which is perfect for Preschool Paper Weaving activities – as the strips are larger and better for small hands. 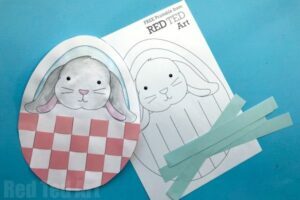 Check out our second Bunny Basket Weaving Art Project! 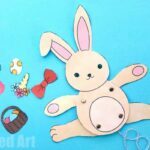 Do watch the Bunny Basket Card video .. or follow the step by step Basket Paper Weaving instructions below! 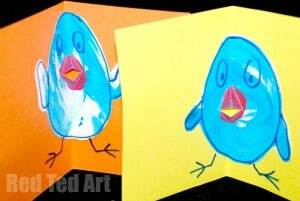 Ok.. you will notice that the images below are “borrowed” from our Woven Egg & Chick Card!!! I really hope you don’t mind. 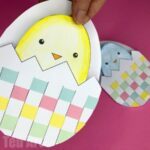 I have been SOOOOO busy creating all these FREE Paper Weaving Printables for you… and wanted to get them all on the website as quickly as possible (to give you plenty of time to get crafty).. that I am running short of time… so hopefully you will look past the cute little chick in these images.. and in your minds’ eye only see a bunny in a basket!! 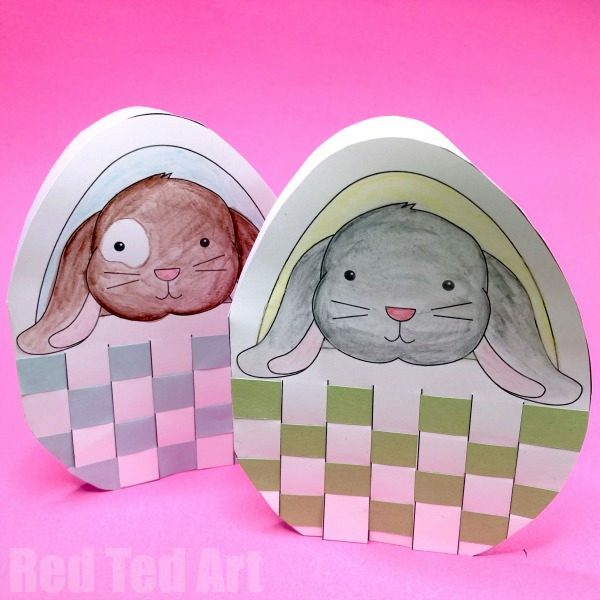 The main difference is that you don’t cut the bunny basket handle off! 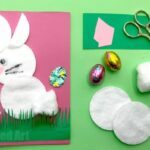 We do really love how easy these Woven Bunny cards are to make and how lovely the paper weaving looks! 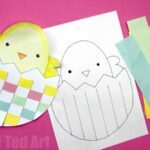 Perfect Easter Egg patterns! 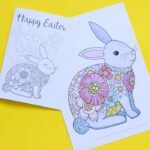 Begin by printing out your free Easter Printable onto light card stock – paper works too, but light card stock just gives it a neater finish! 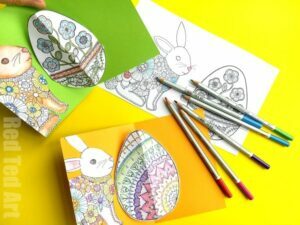 Colour in your Bunny in whatever colour you like! We also coloured the background behind the bunny (yellow or blue in our case). 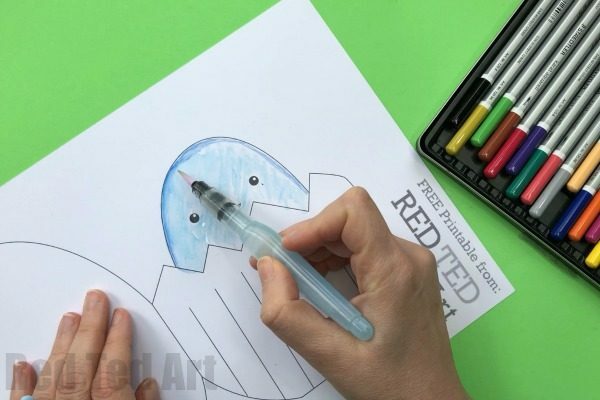 If you are using the watercolour pencils like we have.. let the chick dry fully before moving on. 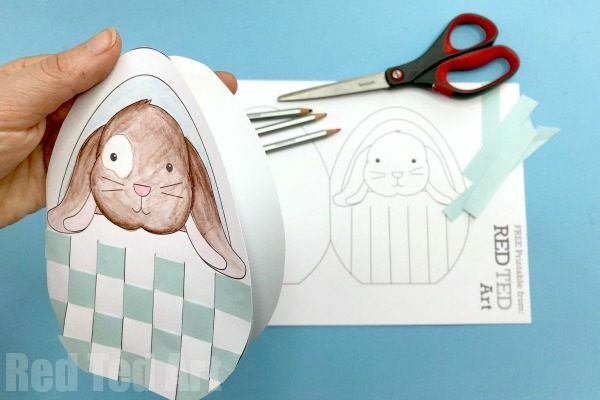 Open the card and check that the Bunny Basket is cut neatly. 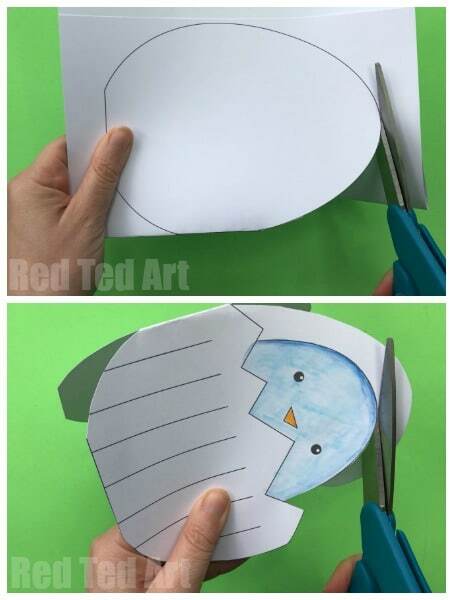 If need be trim a little extra off..
Cut along the lines of your basket card. 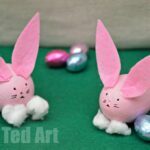 Continue until you come to the bottom of the egg basket. 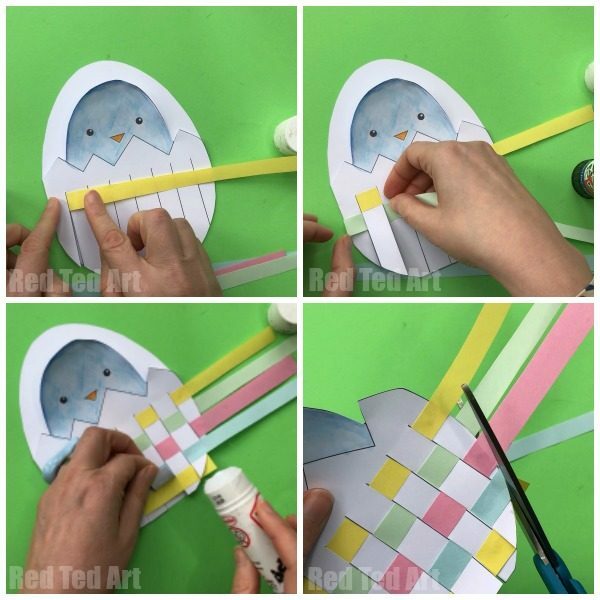 I find it helps to glue down each part of the last strip to secure and “neaten” the final egg. These are absolutely amazing i love all of you projects! !